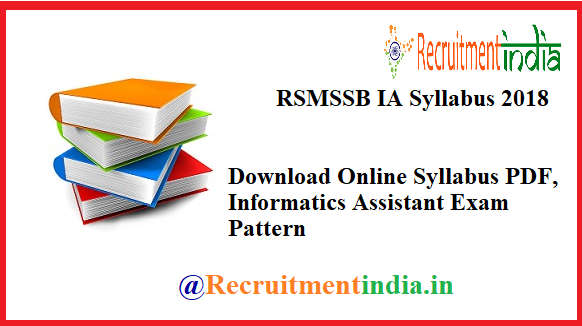 Obtain the RSMSSB Informatics Assistant Syllabus 2018 helpful for the scoring in the written exam. Newly this IA jobs notification has been revealed by the officials. It contains a good number of vacancies that is around 1302 vacancy posts. Then for the unemployed candidates particularly who are waiting for a Rajasthan State Government job will certainly want to apply for these vacancies. Once they know about the application procedure, later they will make a serious search for the syllabus and exam pattern of DOITC IA posts. Our team recognised their need for syllabus and posted that IA syllabus in this post. Analyse the RSMSSB Informatics Assistant Exam Pattern to have information about the questions and sections asked in the exam. How marks are allotted for each section, what type of questions were asked in that section, how to score more marks in the given exam time etc these are the questions that revolve in the minds of the applicants who are intent in this 1302 posts recruitment. The single solution for all these types of questions is our post. A complete set of guidance to prepare for the RSMSSB IA Selection Process 2018-19 is dropped in this page. Follow up upcoming Sarkari Jobs 2018-19. Negative Marking is there. 1/3rd negative marking. 40% of marks are the minimum qualifying marks. Question paper maintains Degree standards. General Knowledge and Current Affairs relating to India and Rajasthan, Major developments in the field of Information Technology. Overview of the Computer System including input-output devices, pointing devices, and scanner. Introduction to Operating System, Word Processing (MS-Word), Spread Sheet Software (MS Excel), Presentation Software (MS Power Point), DBMS Software (MS-Access). Representation of Data (Digital versus Analog, Number System — Decimal, Binary & Hexadecimal), Introduction to Data Processing, Concepts of files and its types. Introduction of Internet Technology and Protocol, LAN, MAN, WAN, Search Services/Engines, Introduction to online & offline messaging, World Wide Web Browsers, Web publishing, Creation & maintenance of Websites, HTML Interactivity Tools, Multimedia and Graphics, Voice Mail and Video Conferencing, Introduction to e-Commerce. Security: Protecting Computer Systems from viruses & malicious attacks, Introduction to Firewalls and its utility, Backup & Restoring data. Algorithms for Problem Solving, Introduction to C Language, Principles and Programming Techniques, Introduction of Object Oriented Programming (OOPs) concepts, Introduction to “Integrated Development Environment” and its advantages. www.rsmssb.rajasthan.gov.in RSMSSB IA syllabus is visible to all the applicants. This syllabus will be released by the officials very soon. Actually, in the notification only, syllabus topics are given. Some people may not notice it, so for the sake of all the enrolled candidates, a separate notice of syllabus of IA exam is going to be uploaded once the recruitment application form is started. An intimation about the released syllabus also will be given to you so be a frequent visitor to this page. A maximum number of people will begin the study RSMSSB IA Syllabus 2018 immediately when the recruitment update is heard by them. So during their preparation phase, the syllabus and previous papers are the very effective things. Some preparation tips are listed to get manage the whole exam well, which topics are more important. In this Rajasthan SMSSB IA exam, there are two parts one is completely written exam of 3hrs with negative marking of 1/3rd. The second part is typing test in the languages of Hindi and English. is there negative marking in information assistant exam?? any idea of cut off? no there is no negtive marking.